I went for a little stroll through the country with Ed the Tall on Sat. Our path of choice was the Bouquet Ramble, a ride that always serves me a dish of pain-cakes. It climbs a significant distance, both in elevation and in mileage, so you would expect it to be kinda' hard, but there is something about this one that just hurts me. So it was a familiar site to see Ed riding away from me as the trail turned up and up. He is a decent fellow though, and always waits at the top for old billy goats like me, hence the blog entry title. The temps have begin to drop in our little piece of paradise and overnights have been getting into the 30s. It was a sunny day for the most part, maybe into the low 60s, but the wind was coming up and it looked like we were going to be riding right into the teeth of it. 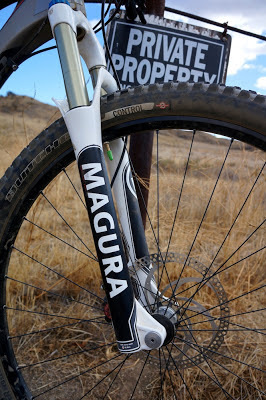 We were both on our Cambers, so we had good trail bikes under us. 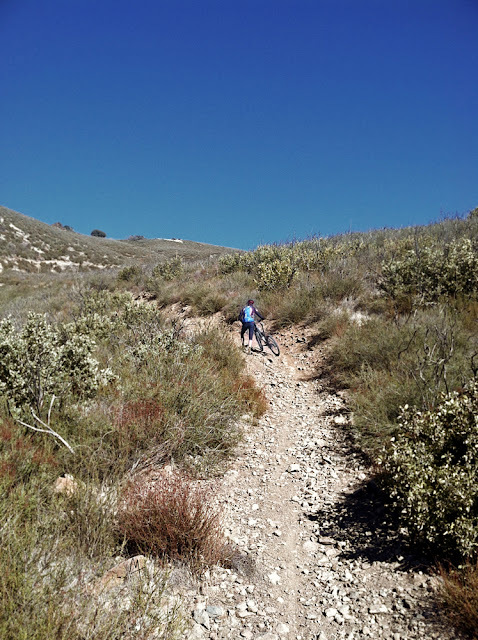 This route takes us through an OHV area and runs along some moto trails so rocks and whoops are de rigueur. We were up onto the high ridge line after climbing for a couple of hours and the winds were fierce. They have recorded 100mph winds up here and it was a cold blow too. Brrrrr. So, to buffer that a bit, we opted to stay on the shielded side and ride a moto trail that we normally ride from the other end. This would mean some hike-a-bike and we knew that going in, but it seemed like a decent compromise. It was a good choice, but it was taxing too. When your handlebars are higher than your head, you know you are pushing up a steep trail. A long, long single track drop and we were back to civilization but we were aware that the sun was dropping fast. The wind and the pushing had slowed our progress bit, so we opted to bypass the snack stop at the country store and head for the cars, still an hour and some climbing away. And there was that wind still. It was stronger now and getting cold, likely into the low 50s, high 40s. Once we lost the sun, it would drop fast. Time to go. I had been battling a leg cramp for a while, but now it gave in and I was able to push hard again. I almost was keeping up with Ed, but I backed off a bit just so he could wait for me at the last saddle. I know how much he likes that. Hah! Today the winds are even stronger than on Saturday. It is cold and nasty if you are on top of any rise in the terrain and facing north. I called Ed and suggested we go ride. After all, he has not waited for anyone all day.